Disneyland opened in 1955. Walt Disney bought 160 acres of California land that had been covered in orange groves and spent $17 million on the park. Today over fourteen million people visit the park annually and spend about $3 billion. Velcro was patented by George de Mestral in 1955. He received patent number 2717437. Children could make a list of things that use Velcro. For example, some shoes use Velcro. Captain Kangaroo premiered on television on CBS in 1955. The show ended in 1984. Mickey Mouse Club began its first season on ABC also in 1955. The original series ended in 1960, but it was revamped in 1977 to 1979 and again in 1989 to 1996. Austria celebrates a national day; in 1955 the country adopted a stance of permanent neutrality. A landlocked country in Europe, Austria is slightly smaller than the state of Maine, and Vienna is the capital. Machinery production and tourism are major sources of income. Over eight million people live in Austria. Montgomery Bus Boycott began in 1955. 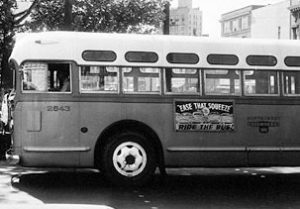 Following Rosa Parks’s arrest on December 1, 1955, African Americans boycotted buses until December 20, 1956. A Supreme Court ruling forced the integration of the bus system. See the PBS segment, including video and photos at: Montgomery Bus Boycott. Montgomery, Alabama, bus boycott ended in 1956. A Supreme Court decision forced the bus company to end segregation. The boycott had begun December 5, 1955, over a year before. Children can learn more at: Bus Boycott. Salk vaccine was allowed to be used for the first time in 1955. Dr. Jonas E. Salk produced the vaccine to prevent infantile paralysis, also known as poliomyelitis. Prior to the vaccination, polio was one of the worst diseases around. Salk started conducting research in 1947. He field-tested his vaccination in 1953, and it became available to the public in 1955. Today polio has almost been eradicated world-wide. The $64,000 Question television game show premiered in 1955. Contestants answered questions about an area where they felt they were experts. If a contestant answered a question correctly, he/she could double the money won and move on to a more difficult question. Idea: Children could design and play a variation of The $64,000 Question.